Millicent Fawcett is the first woman to be commemorated with a statue in Parliament Square. It’s also the first statue in the square designed by a woman, Gillian Wearing. It was dedicated on April 25, 2018. In 1866 at the age of 19 Fawcett collected signatures for the first petition demanding female suffrage to be handed into Parliament. In 1928, she was up in the Ladies’ Gallery in the House of Lords watching the Equal Franchise Bill being passed. Around the plinth are the names and (where they exist) pictures of 59 women (and some men) who fought for this right. 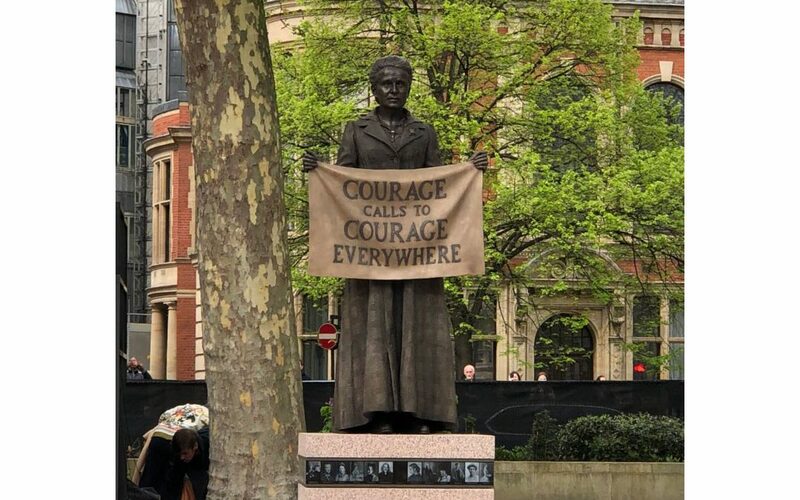 Fawcett is holding a placard that says “courage calls to courage everywhere” — a quote from a speech she made after the death of suffragette Emily Davison, who died when she was hit by King George V’s horse at the Epsom Derby in 1913. There are 11 statues of men in the square: former South African president and anti-apartheid revolutionary, Nelson Mandela; former US president Abraham Lincoln; leader of the Indian independence movement Mahatma Gandhi; former South African prime minister Jan Smuts; and former British prime ministers Sir Winston Churchill; David Lloyd George; William Gladstone; George Canning; Henry John Temple; Edward Smith-Stanley; and Benjamin Disraeli.